Examining The Qur'anIt is worthwhile knowing something about the Orientalism and its distortion of Islam. The academic study of the Oriental East by the Occidental West was often motivated and often co-operated hand-in-hand with the imperialistic aims of the European colonial powers. Without a doubt, the foundations of Orientalism are in the maxim "Know thy enemy". When the Christian Nations of Europe began their long campaign to colonize and conquer the rest of the world for their own benefit, they brought their academic and missionary resources to bear in order to help them with their task. Orientalists and missionaries whose ranks often overlapped, not just the servants of an imperialist government who were using their services as a way to subdue or weaken an enemy, however subtly. Quite a few Orientalist scholars were Christian missionaries. Two examples worth mentioning are that of Sir William Muir and Rev. St. Claire Tisdall, who were active missionaries and authors of several books on Islam. Today, these books are viewed as very biased studies, even though they continue to be used as references for those wishing to attack Islam to this very day. That Christians were the source of some of the worst lies and distortions about Islam should come as no surprise, since Islam was its main "competitor" on the stage of World Religions. Far from honouring the commandment not to bear false witness against one's neighbour, Christians distortions and outright lies about Islam were widespread. The modern day Orientalists may have become de-Christianised, but there still exist some age-old notions about Islam. The Christian missionaries as usual, rely on the material of Orientalists. But unfortunately, the Orientalists do not say what the Christian missionaries would like to point out. Hence misquoting is very rife in Christian missionary writing as most of the articles below would show. This page exclusively deals with the Christian missionary propaganda, lies and distortion about the Qur'an. The Muslims assert that the Qur'an is same as recited by the Prophet Muhammad(P). There are no additional materials added to it nor subtracted after the death of the Prophet(P). We have divided them into following sections so as to enable the reader to understand the issues involved here. In this section, the Tafsir of some of the important verses of the Qur'an misquoted by the Christian missionaries would be provided along with the methodology of interpreting the Qur'an. The content is be primarily the interesting papers published in peer-reviewed journals. Some material is also the excerpts from books. The aim of bringing such material on the web is to disseminate interesting information which otherwise would end up getting stacked in the libraries, unread. Integrity of the Bible according to the Qur'an? May be we should first check what the Church tradition has to say about the integrity or lack of it of the Bible! 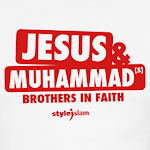 What about the Bible at the time of Muhammad(P)? Is The Bible In Our Hands Same As During The Time Of Muhammad(P)? Insha'allah, more information can be obtained by clicking on the above and following the argument through the links.